Did someone say cake? As you probably know, we love a bit of cake. From cupcakes to enormous cakes filled with Nutella, honeycomb, cream, peanut butter, and everything in between—we're a bit obsessed. So, when it came to putting together a recipe for an Easter themed cake, we looked for the best. And we couldn't look any further than our favourite cake maker—Alice Bennett, the genius behind Miss Trixie Drinks Tea. If you haven't come across her well-loved Instagram yet then you're absolutely missing out. It's filled with photos showing the wide array of Alice's talents, with cakes made for birthdays, weddings, and so much more. 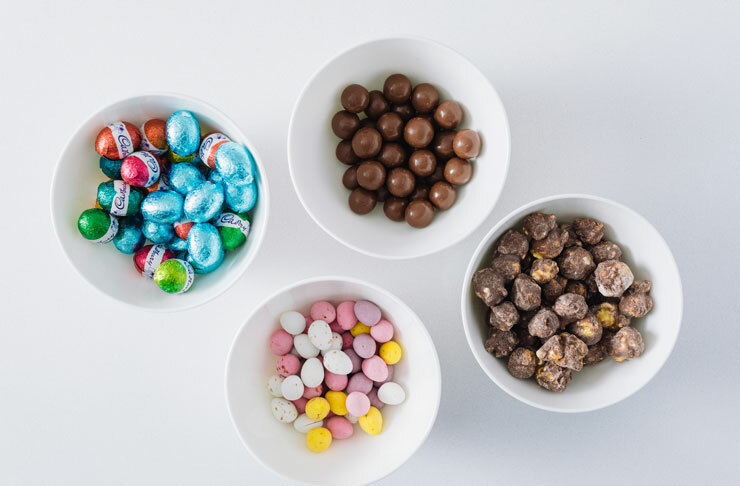 Here's how to put together this Easter extravaganza, impress your friends and family this Easter. Preheat oven to 160 degrees fan forced; 180 degrees conventional. Line baking tins with greaseproof paper and grease with melted butter / non-stick spray. Place sifted cocoa powder, chocolate, coffee powder and boiling water into a glass bowl and whisk to combine. Allow to cool to room temperature. Once cooled, whisk through sour cream and set aside. In a separate bowl, sift flour, baking soda and salt and whisk to combine. Set aside. Using an electric mixer, beat together butter, sugars and vanilla extract. Once combined, add eggs one at a time and beat between each addition. Add half chocolate mixture and half flour mixture to the butter mixture and beat to combine. Repeat with remaining half and mix through. Evenly divide batter between three cake tins and cook for 40 mins. Check cakes are cooked with a skewer that comes out clean when poked into the cake. Allow cakes to sit in tins for 15 mins before turning out onto a cooling rack to cool completely. Place butter into the bowl of an electric beater and beat until pale in colour. Gradually add sifted icing sugar in batches and continue to beat. Add salt and vanilla at the end and beat through. Add a drop or two of purple food dye until you have the colour you want. In a saucepan, bring milk, honey and cream to a simmer over medium heat. Once the milk starts to produce small bubbles around the outside of the saucepan, pour milk over chocolate. Be careful not to splash. Allow to sit for 30 seconds before mixing. Mix milk and chocolate with a spoon, before adding cubed butter. Continue to mix together until all the butter has melted through. Pop into a plastic container and store in the fridge until required. 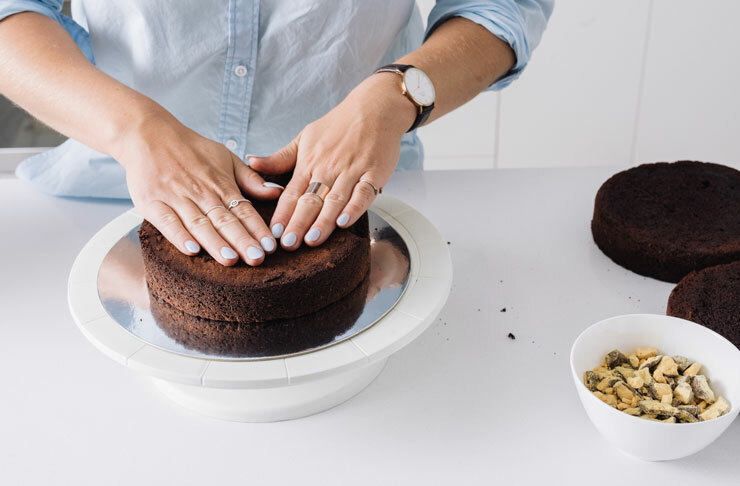 Take cooled cakes and trim to size – if they are looking a little uneven, take a bread knife and carefully cut until they are flat and even. Place a schmear of buttercream onto your cake board and press first cake on the board. Once the first layer of cake is fixed to your cake board, thickly spread buttercream onto cake. Top with crushed honeycomb and place the next cake layer on top. Repeat process. Once all cakes have been stacked, using a pallet knife, gently start to spread buttercream around the edges and side of the cake. 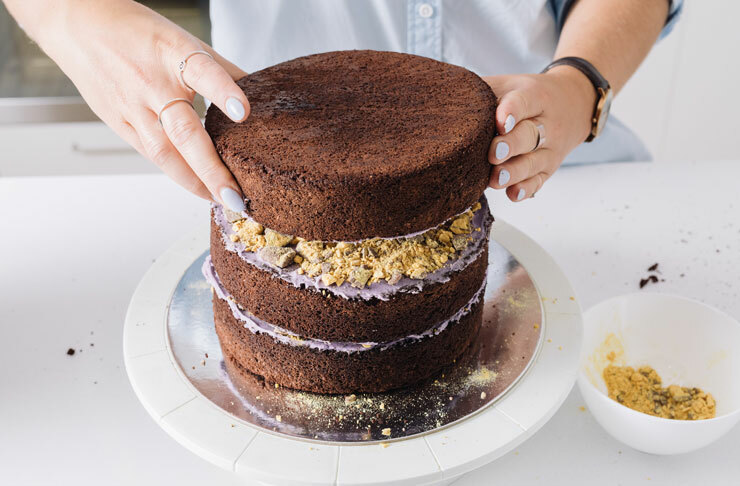 The first layer of buttercream only needs to be thin. It is called a crumb coat and is designed to catch any loose crumbs and fix them into place. You should still be able to see your cake through your first thin layer of buttercream. 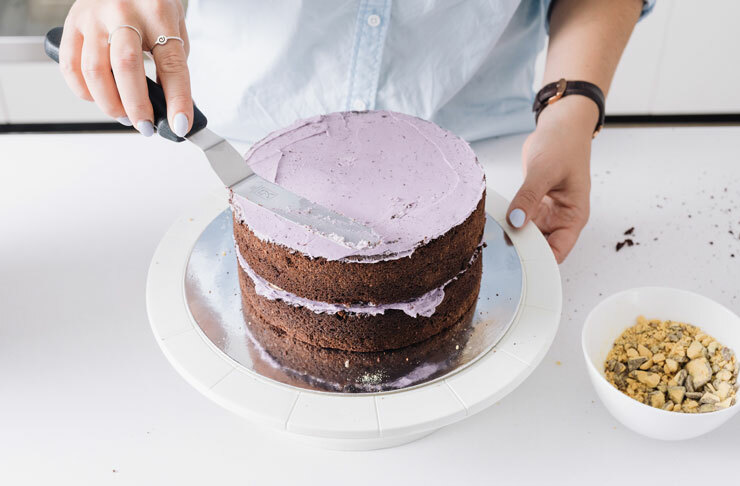 Place cake into the freezer for 15 – 25 mins once you’ve done your crumb coat. Take the cake from freezer and lather another layer of buttercream. This layer should completely cover the cake. Using a plastic scraper, smooth edges and remove any excess buttercream. Continue to smooth and patch over any holes. 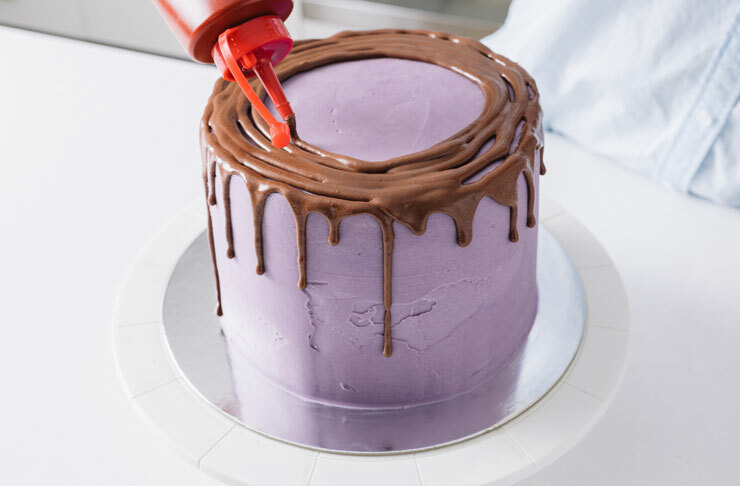 Once the cake is completely covered, place chocolate sauce into a squeezy bottle or alternatively, using a spoon, squeeze chocolate sauce onto the edges of the cake so that it drips down the sizes. Remember to start with a little and then you can go back to add more drips if you need. 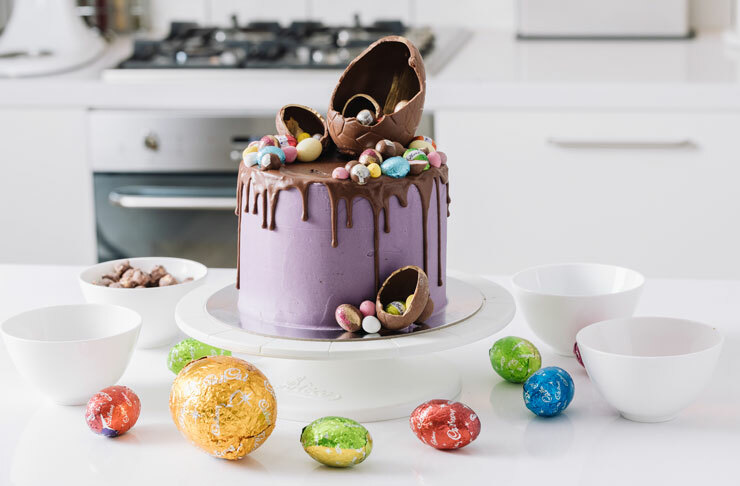 Decorate the cake with your chocolate eggs. Start by gently breaking open a large chocolate egg and placing it close to an edge of the cake. From there, fan out your little Easter eggs, Maltesers and other decorations to form a crescent shape on top of the cake. Continue to play and decorate as you desire. If you wish, using a paint brush and some gold lustre dust, brush the eggs with the dust to give them a shimmer. You're probably going to need some Hot Cross Buns to go with your cake, well, we've got a recipe for that too.